Cybils Review: The Periodic Table: Elements with Style! I’ve been looking forward to reading this book ever since I saw it mentioned on Carol‘s and Rebecca‘s blogs. Artist Simon Basher and chemistry teacher Adrian Dingle have created a vivid rogues’ gallery of elements guaranteed to bring the periodic table to life and appeal to kids of all ages. I’ll be the first to admit I’m the originally fuddy-duddy, but there’s something about this anime-style, Facebook approach to the periodic table that’s remarkably engaging. Not to mention a sensible approach to making the subject — indeed, the individual elements — memorable for everyone from fourth or fifth graders to college seniors (not to mention home educating parents who majored in, say, history). And memorable is what you want when it comes to learning about the periodic table. Basher, who came up with the idea for the book, has said, “It’s really been designed to engage you on a gentle level and also to act as a memory trigger. 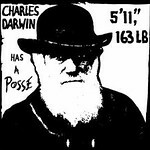 There really is no reason to think of science as boring, as I’ve discovered, and I hope readers will see the fun side of it.” Echoed by Mr. Dingle, who writes, “This is not an academic book by any stretch of the imagination, but it does offer a window or gateway to getting interested in the elements. 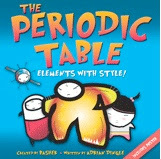 I see it as a very accessible opportunity to learn a little about some chemistry.” In fact, The Periodic Table takes the “memory trigger” several giant steps further than does another nonfiction book familiar to home schoolers — Yo, Millard Fillmore — because the illustrations and text are all about the elements. Don’t let my heavyweight status fool you — at heart I’m a completely malleable softy. I am so easy to work with that the ancient Romans used me for their water pipes. My chemical symbol (and the word “plumbing”) comes from by Latin name, plumbum.Over the years, I’ve gained a bad rep. People say that I build up in bones as a slow poison and that I have damaged childrens’ [sic] development. It’s true that I have an unfortunate ability to slip easily into the food chain — from pipes and cookware, leaded gasoline, and paints to fisherman’s weights. I have also been blamed for ending the ancient Roman civilization. Not fair! These days, I am closely regulated. But I am still used as a shield against x-rays, for roofing, and in stained glass. Adding to the delight is a removable periodic table poster — definitely stylish, more cool than geeky — accompanying the book. Just the right thing for your young scientist to hang over the desk (or bed, depending on how much he or she really likes this stuff); though I realize, aside from the home educating crowd, who’ll be tempted to post it in the kitchen, most families will be content to borrow the book from the local or school library. Besides the poster, the book also includes an index and a glossary. I liked the idea of chemistry but found the textbook really unstimulating. I always had more of an interest in art and music.I was lucky enough to have a great high school art teacher who really encouraged me to look at new art and also introduced me to a lot of great music. My passion for science and math came much later in life. While working on the book I did meet a materials scientist from MIT who really gave me some fantastic ideas and tips for the book. He had a real passion for art as well and he loved the idea. Now there’s something everyone can get. The Mystery of the Periodic Table by Benjamin D. Wiker, with charming illustrations by Jeanne Bendick; a delightful living book, published in 2003 by Bethlehem Books as part of their “Living History Library”. The Periodic Table of Videos, from the University of Nottingham; more videos featuring the University’s Prof. Poliakoff are over at Test Tube. An interactive periodic table. And another one. UPDATED to add: From the comments below, Crissy at Soliloquy‘s favorite periodic table is here. (If you have trouble with that link for some reason, try this one.) She downloaded the PDF and printed a 20″ x 30″ poster for each of her sons. Many thanks for sharing that one, Crissy! 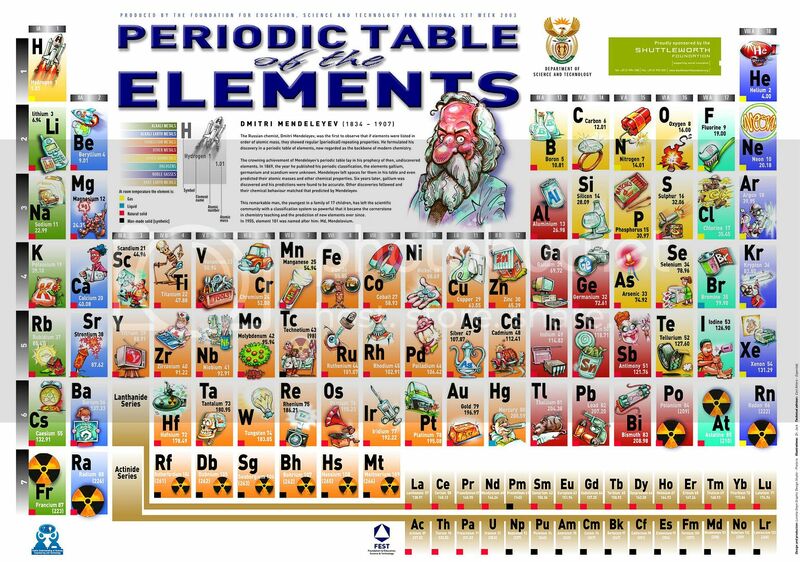 UPDATED further to include The Periodic Table of Periodic Tables! Dawn gave me the idea about using Lego in connection with learning about elements and the periodic table. Here is her post with the photo of her son building elements; he’s taking a Lego chemistry class for middle schoolers at MIT, where the curriculum includes using Lego bricks to model the elements. And then I found this this Lego periodic table, as well as this Lego advertisement featuring another Lego periodic table. “It’s Elemental”, science education resources from Jefferson Lab, including math, bingo, word search, flash cards, word scramble, and crossword puzzle. The five-disc “Periodic Table for Students” DVD series from Schlessinger. How about a Periodic Table fridge magnet, where each element is a separate magnet? And for those who appreciate the mysteries of science, Dr. Camille Minichino, who has a Ph.D. in physics from Fordham University, is the author of the eight volumes in the Periodic Table Mysteries: hydrogen, helium, lithium, beryllium, boric acid, carbon, nitrogen, and oxygen are all accounted for so far. Late, late, return the lifts. Two Writing Teachers are hosting today’s Poetry Friday Round-Up. Thanks, and happy reading (and writing)! I know my parents for certain and probably some readers consider the more severe winter temperatures up here (-18C this afternoon, around 0 F, and with a bitter wind) “fruitcake weather”. As in, suitable only for fruitcakes like us, content in the ice and snow and it’s not even December yet, for Pete’s sake. The person to whom she is speaking is myself. I am seven; she is sixty-something. We are cousins, very distant ones, and we have lived together — well, as long as I can remember. Other people inhabit the house, relatives; and though they have power over us, and frequently make us cry, we are not, on the whole, too much aware of them. We are each other’s best friend. She calls me Buddy, in memory of a boy who was formerly her best friend. The other Buddy died in the 1880’s, when she was still a child. She is still a child. And if you’re a fruitcake fan, and perhaps especially if you’re not yet convinced by the merits of fruitcake, you might want to have a look at this recipe from Gina’s Gingerbread; I think I’d use dark rum rather than Grand Marnier, and the darker the chocolate the better. Nominations for the 2007 Cybils awards closed last Wednesday (don’t say I didn’t warn you). So here’s the list of nominated titles in the Middle Grade/Young Adult nonfiction category. All of the Amazon.com and BookSense links Cybils-affiliated and provide a small commission to the Cybils to help pay for (modest) prizes. The Ultimate Interactive Atlas of the World by Elaine Jackson et al. The rest of the nominees in the other categories are here. Happy reading! Yesterday we celebrated Davy’s seventh birthday and American Thanksgiving. He was delighted to have turkey with all the trimmings, especially cranberry sauce, for his birthday meal, and I was happy to have a leisurely day to prepare, and a leisurely dinnertime to enjoy, our harvest feast, which included all of the usual suspects along with homemade pumpkin chiffon pie and a homemade lemon meringue pie complete with seven candles. to his newly refurbished mukluks (collected in time for his birthday), Davy, or Gray Elk as he asked me to call him last night before bed, had lots of fun, spending most of yesterday outdoors. Other presents included the Shoot-a-Loop game from Laura; a toy John Deere tractor from Daniel; “Ratatouille”, gift #1 from my parents (Pecos Bill, gift #2, having been held up at the border ’til later this week); a small hatchet from his other grandparents; and the much longed for (to complete the collection read endlessly at bedtime in the bunk) Blaze and the Gray Spotted Pony. Today, after chores are done — and they’ll take a bit longer because it’s supposed to be a cold week ahead, going down to -35C tonight and not too much warmer during the day tomorrow — we’re going to hunker down in our warm house that still retains the scents of yesterday’s turkey and baking. We have an ample supply of delicious leftovers, the big Grey Cup football on television for Tom that doesn’t bother me as long as I have something to curl up with on the couch (and I do, since Film Club finally arrived from the library), and new toys for Davy to share with his siblings. Come neatly wrapped in cellophane. Hairline most likely to recede. Americans Hundred Per Cent For Love. By rubbing boy and girl together. Except, one hoped, the eager groom. In chairs of leather, simulated. But lots of paid-up life insurance. All ready-seasoned, heat it up. On instant coffee from a can. Be proud, love, of your instant man. The messy horrors of digestion? And now our pure, hygienic night. And cream is patted on your frown. Is wrapped in paper like fresh bread. Turn the electric blanket higher. (Just add devotion, dear, and serve). The landlord’s Plymouth prowling near. It was an All-American day. Susan Taylor Brown at Susan Writes has today’s Poetry Friday Round-Up, and a lovely poem by Alfred Kreymborg. Thank you, Susan, from under a sunny sky.